Today I’m very happy to have Alberto Arrighini, hailing from Italiano Automatico, guest post on Lingholic. 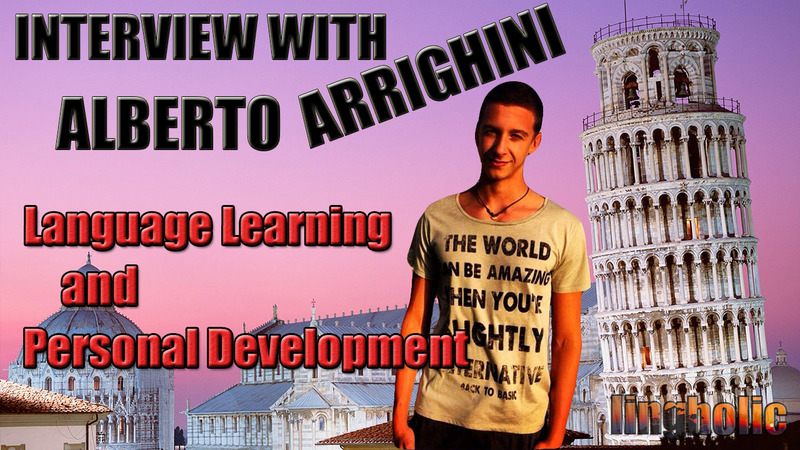 I’ve also had the chance to interview Alberto on his language learning and life philosophies, and as you’ll see, Alberto is a very enthusiastic and inspiring young man with lots of great ideas. In the interview I conducted (see bottom of this post), Alberto talks at length about the way he uses books and other kinds of material he enjoys in his everyday life to learn foreign languages. Simply put, why not do in a foreign language what you enjoy doing in your mother tongue? Alberto’s passion is all about self-development and health, and you’ll see why! Finally, Alberto tells us why eating healthily is so important to learning more efficiently, and how you can do it too. I hope you’ll enjoy both the post and the interview, and as usual, you’re more than welcome to get involved by commenting below and sharing your personal stories with the rest of us. I now turn to Alberto for the rest of this post! As I mention in the interview video below, it’s very important that you learn with material you’re passionate about. This allows you to maintain the focus needed to learn a language while you’re also enjoying the learning process. I’ve personally found a great way to combine personal development (books/audios that allow you to improve yourself) with language learning. The great concept that really makes this combination a perfect one is that you need to read/listen many times to personal development material if you really want to improve your life, and guess what? You need to listen many times to the same thing if you want to learn a language naturally and with the method I use. Without knowing it at the time, I was doing the best thing I could do to modify my subconscious mind filling it with the knowledge and ideas needed to overcome that fear! By doing that I was able to listen to many hours of audios with huge focus! Why? Very simple! Because I was hugely interested in the content and I wanted to improve my life by overcoming that fear! If you get this concept, it can really revolutionize your life as it is doing for me. N.B. Nothing wrong with listening to Harry Potter, but the outcome if you try what I’m proposing here is completely different, and you’ll attract into your life more interesting people thanks to the things you’re learning about who you are and how you work. The only problem for Italian, for example, was that there weren’t many interesting resources. And if they were there, the audio was fast and difficult to understand. That’s why I decided to create Italiano Automatico on January 2013. I could write a book about this, but now let’s talk a bit about health. I’ve been pursuing a healthier life since I started the process of personal development 2 years ago. It all started with some books… I got to know and understand things that I didn’t even notice before. I do suggest you start reading books like “The China Study”, “The PH Miracle”, “Spark!”, “Sugar Blues”, so that you can decide by yourself what you want to do with your diet. As you see, these are all easy things to do. And the difference in 3-5-10-20 years is HUGE. I wish you the best life you can live! Great post! Alberto’s emphasis on learning through materials you’re passionate about – and his motivation for creating Italiano Automatico – is the same thing that led me and my team to create http://www.linguistadores.com. We offer authentic news, music, and videos for Spanish, English, Dutch, German, and French – no Italian yet! – so I look forward to using Italiano Automatico to prepare for my May trip to Sicily! Yay! Fun interview guys, thanks. I’m in fact studying Italian at the moment (not too disciplined though). I’d never seen your site Alberto so I’m looking forward to exploring it! Great timing. I really haven’t done much, just listen to some Pimsleur recordings over the last couple years, however with my Spanish and Portuguese background, the Italian is quite similar. That’s cool he’ll be translating your articles!